Ooo.. this weather warning was issued an hour ago. According to the Australia's Bureau of Meteorology, Brisbane is set to be hit with severe thunderstorms which is likely to produce large hailstones, damaging winds and very heavy rainfall in the warning area over the next several hours. Cool huh? It's probably a reflection of the first one nonetheless, it looks absulutely stunning! Here's a closer look. With Microsoft trying to gain advantage over competition by launching the Xbox 360 the earliest, the Console war rages on between M$, Sony and Nintendo. The result? It isn't quite what M$ expected with a number of problems rearing their ugly heads at the most crucial moment: launch date. First and foremost, M$ have underestimated the Xbox 360's demand and are falling terribly short of pieces all over. Some unfortunate souls who've pre-ordered their 360s are being made to wait till January due to massive shortage. Besides having to wait in lines for nearly ten hours, gamers now have a new problem on their hands as it seems the Xbox 360 isn't very stable. Users all over are complaining about constant crashes and stuttering and freeze ups during offline and online play. Is this caused by overheating? Is it a software problem? Is there a problem with their copies? No one knows for sure, but the bottom line is that their celebration was cut extremely short by these nonsense. According to Microsoft's spokesperson, only 15% of the users are facing the problem and even states that on a launch of this magnitude, problems were bound to arise. ahh.. feels like home...! 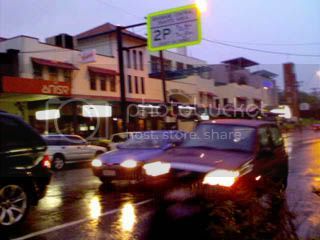 It's been raining every evening in Brisbane for the past week and the weather, which is suppose to be hot and dry this time of the year, turned out to be wet and cloudy... just like KL. It's been a good week... really busy at work but managed to finish up my weekly stuff without any major hiccups... way beyond my expectations actually. If you dun haf enough cash to purchase one of those 'funky' car locks that is attached to your steering wheel or your gear, here's an alternative... old fashion, but still as effective. Ohh... actual performance may vary. No guarantees. Bush: Dude, where's the exit?! Ahh.. it's the time of the month where I do my Bush-bashing... While on his East Asian tour recently, George W Bush has had his exit strategy from a Beijing news conference foiled by locked doors. The president was looking for a quick escape after apparently becoming annoyed with reporters. The president tugged at both handles on the double doors before admitting: "I was trying to escape. Obviously, it didn't work." 15 years ago, it was Mayfair, Fleet Street and King Cross Station... today it's google, friendster and MSN IM! Altough it's a parody, it shows how time moves from physical to virtual address. I'm always amaze by the new technology and concepts that emerges everyday. 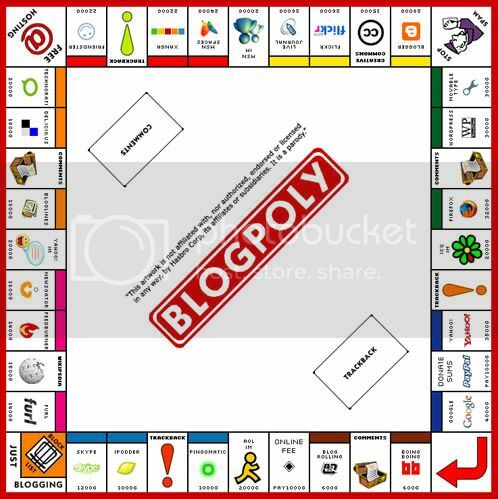 It's a David and Goliath story of a blog defeating a mega-corporation. What went down... on Oct 31, Mark Russinovich broke the story in his blog: Sony BMG Music Entertainment distributed a copy-protection scheme with music CDs that secretly installed a rootkit on computers. This software tool is run without your knowledge or consent - if it's loaded on your computer with a CD, a hacker can gain and maintain access to your system and you wouldn't know it. The Sony code modifies Windows so you can't tell it's there, a process called "cloaking" in the hacker world. It acts as spyware, surreptitiously sending information about you to Sony. And it can't be removed; trying to get rid of it damages Windows. The mainstream media took it up after it circulated around the blogosphere. On Nov 11, Sony announced it was temporarily halting production of that copy-protection scheme. Fearing a public backlash, on Nov 14 the company announced it was pulling copy-protected CDs from store shelves and offered to replace customers' infected CDs for free. The funny thing is, this rootkit was designed to prevent copyright infringement but...itself may have infringed on copyright. It might seem, the code seems have come from an open-source MP3 encoder called LAME found in sourceforge.net... I smell a lawsuit! In an earlier press release, Sony announced that 20 titles were affected. Sony has now published a full list of the 52 titles. It is also working on an improved uninstaller that does not leave PCs open to more attacks. IMHO, if this is what mega-corporation does to those who buy 'ori' products... I'd rather stick with those from 3 for RM10 in Bkt Bintang plaza. What a PR nightmare for the struggling giant. After a waiting for 32 years, Australia stood their ground in front of 82,698 fans and took the game to penalties. Mark Schwarzer saved twice, from Fabian Estoyonoff and Dario Rodriguez, before John Aloisi tucked away Australia's fifth spot-kick to secure a memorable win. Coach Guus Hiddink, who is also in charge of Dutch side PSV Eindhoven, now has the opportunity to enhance his World Cup pedigree after taking joint hosts South Korea to the semi-finals in 2002. The equation is simple. 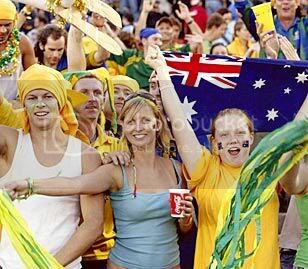 If Australia beats Uruguay in the decisive World Cup qualifier by two goals or more, the nation, which already whips itself into stratospheric frenzies over rugby, AFL, cricket and the occasional horse race, will have yet another game to shout and argue about. 18:59 Kick-off in 2 mins...! Can't believe that there are so many football fans in Aus! Telstra stadium is PACKED! 19:35 Throw in... Kewell dribbles' into Uruguay territory tries to kick, misses... the ball finds Bresciano and GOAL!! 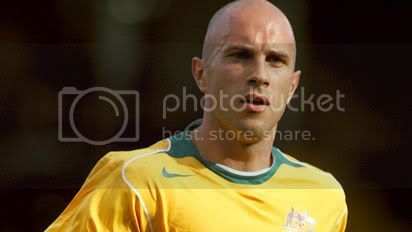 Mark Bresciano SCORES! 19:48 Whew...! Half time.. what an intense game! So many diving, fouls and free kicks given. Uruguay looks good in the first half with Ricorba wasting a few good chances. But it was Australia who took thier chances well and made it 1-0. It's all squared now! 20:58 Full time with Australia leading by 1-0. It's gonna be extra time and from the looks of it... Austrlia dominated the second half with many chances but unable to convert! Kewell was exceptional since coming out as a substitute and was involved in most of the chances. 21:33 The extra time ended without any goals and this is it... PENALTY SHOOTOUT! 21:39 Here we go!! Australia will take the penalty first! Kewell takes the penalty.. and GOAL!!! Beautifully placed to the left!! 21:40 Next is Dario Rodriguez... SAVED BY SCHWARZER!! 21:40 Lucas Neil is next... and SCORED beautifully! 2-0 for Australia! 21:41 Gustavo Varela walks up and scored... schwarzer read carefully but was an inch away... WHAT A WASTE! ughh.. can't take it anymore... 2 more goals to go! 21:42 Mark Viduka steps up... hesitates.... WIDE!!!! oh no! He stares disbelieve and the Telstra stadium looked frazled! Can you believe it? VIDUKA missed! 21:43 Marcelo Zalayeta is next.... Schwarzer's gotta save this...!!! Runs and SAVED!!!! ONE MORE GOAL B4 HISTORY IS MADE...! 21:44 John Aloisi steps up.. concentrates.... runs... AND SCORES!!!!!! AUSTRALIA IS IN GOING TO GERMANY!!! ahh... 2 days out of office for training! Exciting stuff- electricity derivatives and advance electricity derivatives. Sometimes learning more about what goes on behind the energy industry makes you appreciate the technicality behind what we take for granted most- like flicking the light switch on. Can't believe that this is happening in Brissy... according to news flashes, busses, trains and railway stations in Brisbane have been evacuated because of an apparent terrorist threat. No trains were being allowed into the city and all bus services have been stopped.Passengers have been moved at least 100m away from buses and train stations, and all luggage has been removed. Ok.. to get a good nice pic of a historical event, you need to have a good strategic viewing location. Yep... like what the Donald always stress... location, location and location. As you can see, the A380 touches down nicely and this whole event is captured nicely on camera. Yep... a picture paints a thousand word. So to get a photo like this, you need to be at the location at least 2 hours before and get a good unobstructed spot near the landing area. There are over 3000 ppl here, so it is recommended that you park your car some distance away and walk in.. you dun wanna b caught by the after party traffic. As for me... I was at the multi-level car park and since I came late, I didn't haf the time to look for 'secret' spots (should have tough.. since the flight was delayed). If you're interested, here's a site that has a good collection of photo from the event. Click Here! The largest passenger jet in the world has landed in Brisbane for the 85th anniversary of Qantas. 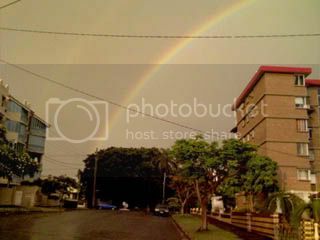 According to news reports, thousands of people turned out to witness the event. 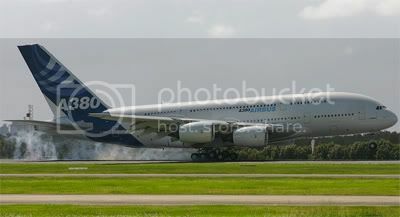 Coming in from Singapore, the huge double-decker Airbus A380 touched down an hour after its scheduled arrival time at Brisbane airport. I thought it would be an opportunity to be part Australia's aviation history and besides... nothing interesting ever happen in Brisbane anyways . To make it easier, here's my 'time log' of the event. 7:15am Ughh... still contemplating if I should go or not. According to promotional and news materials, the organizers expect 100,000 ppl to view this historical event... thinking of the traffic and the car park... what the heck..
8:00am Went up to the top of the domestc carpark as per the promo material and got a spot just in time for the scheduled touch down time. Got a good spot overlooking the domestic airport. Not many ppl here tough.. maybe around 200 at most. 8:15am So many planes landing.. dunno which is A380... Just taking a cue from those guys standing next to me. 9:00am It's coming.. everyone is looking around... one plane landed, it's not the A380... We noticed that a JAL 747 is in queue and not taking off... could be the next one. 9:02am Another plane landed... it's the A380! Didn't manage to get a landing pic as I wasn't sure if it was the A380.. It looked like a regular plane from where I was standing... what a waste...! sighh.. another thing is, it's surprisingly... quiet. Another thing we noticed is the tail is taller as well. Most of the ground crew just stoped in thier track to look at this mammoth. 9:10am The A380 is being taxied to the Qantas hangar 300m away... there are a few cars following the plane. 9:15am Better leave.. dun wanna get caught in traffic haha.. thank God I parked near the entrance. 9:25am Finally for onto the freeway... on the way, we passed by the hanger and noticed that the A380 did not fit into the hanger... it seems that the tail is too tall for the hangar door. The A380 will spend 20 hours in the hangar being dressed in Qantas signage before departing for Sydney, where it is expected to arrive at 9am Sunday, and then on to Melbourne. The Airbus can carry up to 840 passengers in its double-decker cabin, about 40 per cent more than the Boeing 747. The weekend is almost here~!!! muahahaha... love it when Thursday comes, just give you something to look forward to... like a sense of hope in dark times. Anyways, I've been busy at work and writing commentary while trying to make sense of things is really not easy. Someone at work tells you a joke and you say "LOL." You have to get a second phone line so you can order pizza. When someone says, "What did you say?" you reply, "Scroll up!" When you are not at home, you have the 'away' sign in front of your house. You have more friends in friendster than your real friends. Everytime you are sick... you tell your boss that you've been infected by spyware. You start writing http://ivanchoe.blogspot.com when you are filling up home address in your application forms. You buy you handphone from ebay.com... and your computer, car and oh... the house too. Man Utd ends Chelsea's unbeated run! Chelsea's 40-match unbeaten run in the Premiership was ended when Man Utd turned around from it's worst-ever week to win this sparkling Old Trafford encounter. Darren Fletcher scored the only goal of the game just after the half hour from a glorious move. It all started with Wes Brown finding Rooney, whose delicate pass went to Scholes. The former England man knocked the ball to Ronaldo on the left and his pinpoint cross to the far post was met by Fletcher. Stretching his neck, the Scotland midfielder met the ball perfectly and sent his header from the edge of the six-yard box back towards the top corner of the net. Chelsea captain John Terry tried to clear at the far post but the header went over him and into the roof of the net. Chelsea's only real chance of the first half came when Didier Drogba raced on to Frank Lampard's superb 60-yard pass, only to chip weakly at United goalkeeper Edwin Van der Sar. But, as the game wore on, the champions, whose last Premiership defeat was 1-0 at Manchester City just over a year ago, piled on the pressure. However, it was a little to late for Chelsea and it was 1-0 to Man Utd. Man Utd vs Chelsea tonight...! 'nuff said. 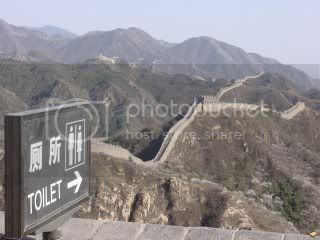 Here's an interesting photo... if you are travelling to China and plan to visit the Great Wall, try to unload b4 you go for the tour... if not.. It's a long long run journey to the toilet. This guy from NZ is putting up his 'unfinished' project for auction. From his testings, there were mixed results and of course, there are no guarantees! The thing is... the auction is now closed (damn!)... but you can still see the product here. A: I dont know a great deal about flux capacitors as my machine does not use one. You could try getting in contact with Marty McFly, his delorean time machine is based on Flux capaitation and he maybe able to supply you with one. 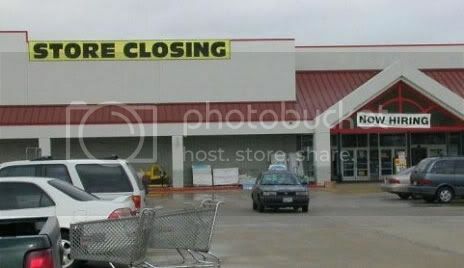 May pay to get a couple cos they dont last to long apparently. I think I saw one for sale on trademe a while back..
A: What kind of dressing ? 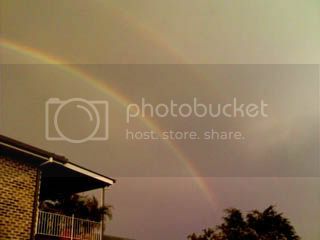 Double Rainbow in Brisbane! ... the Goblet of Fire The problem with Xbox 360 Wet Wet Brisbane... DIY: Car Lock Dangerous if you forgot to unlock it and u reverse the car LOL! Bush: Dude, where's the exit?! Signs of time: Blogpoly Sony in trouble Blogcast: Australia vs Uruguay Lets we celebrate this... we're on the way to Germany 2006 by beating Uruguay by penalty shoot-out... thats really awesome right mate ;) Seriously.. one of the most exciting matches I've seen!!! GERMANY!! 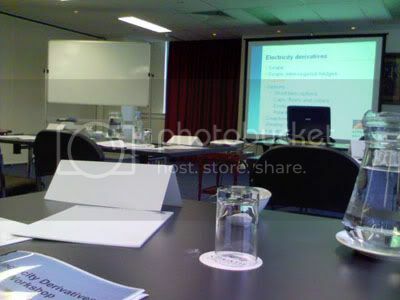 2 days training! Terror Treat in Brisbane! 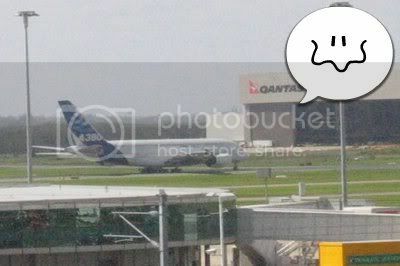 Tips: Taking good pic of the A380 A380 lands in Australia! Signs that you've been Online too long Confusing sign Man Utd ends Chelsea's unbeated run! It was good to see Man United win it. That puts an end to Chelsea's boasting about easily surpassing Arsenal's 49 match unbeaten run (which was also stopped by Man United). Let’s see how Jose copes with a little pressure. Support The A-League and those who support it. Big one tonite,..! Great Wall Toilet? Time Machine for Sale!